Over the past two decades, The Pastor's Wedding Manual has become an indispensable guide for planning and performing weddings and a perennial success in the CBA marketplace. Jim Henry has revised his classic instructional text, combining many of his timeless suggestions from the original manual with fresh, contemporary ideas. - Publisher A classic wedding manual for pastors is updated for a new generation. Covers everything from the rehearsal dinner to the reception and offers tasteful guidance on how to insert into bhp_description_import Select the wedding vows, the proper music, and the order of service. 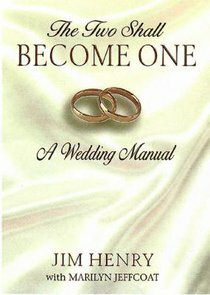 About "The Two Shall Become One"
A classic wedding manual for pastors is updated for a new generation. Covers everything from the rehearsal dinner to the reception and offers tasteful guidance on how to insert into bhp_description_import Select the wedding vows, the proper music, and the order of service. Jim Henry is pastor of a 10,000-member church in Orlando, Florida. He has been a pastor in service for thirty-six years and also served as president of the Southern Baptist Convention. He is the author of In Remembrance of Me, The Two Shall Become One, and The Pastor's Wedding Manual. Marilyn Jeffcoat (M.A., Reformed Theological Seminary) has served as a researcher, writer, and editor of numerous articles and books, including The Prayer Experiment. She holds degrees from Columbia College and Reformed Theological Seminary and is a doctoral student at Trinity Theological Seminary. SPANISH BIO: Marilyn Jeffcoat es la persidenta de Total Sculpt, y ha trabajado como investigadora, escritora, y editora de numerosos libros y articulos.